MEXICO CITY — People who can’t make it to Rome to admire the Sistine Chapel in Vatican City can view a full-size replica of it that opened this week in Mexico City, Reuters reports. More than 2.6 million photographs of the chapel, famous for its frescos by Michelangelo, were taken and printed on canvas for the replica. It is erected on the esplanade of the Monument to the Revolution and covers a total area of 510 square meters (5,480 square feet), according to the city government. 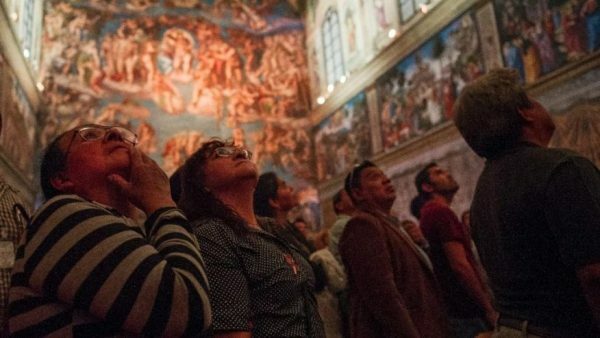 “It is aimed at people who would maybe never be able to travel to Rome, and will have the opportunity to experience being inside the chapel,” said Antonio Berumen, the director of the organizing committee for the Exhibition of the Sistine Chapel in Mexico. For Jorge Serrano, a Cuban national who lives in Mexico City, it was an opportunity he couldn’t miss. “This has given wings to the dreams of many people in the world and it is mainly a gift that has been given to Mexico City,” Serrano said as he lined up with others to view the replica.